Schlock-Wire: Scream Factory Unleashes ARMY OF FRANKENSTEINS On Blu-Ray And DVD – Schlockmania! Los Angeles, CA – Scream Factory has announced the release of Army Of Frankensteins on Blu-ray, DVD, On-Demand and Digital on September 1st. An unstoppable terror is set loose upon a nation divided… and history will never be the same! 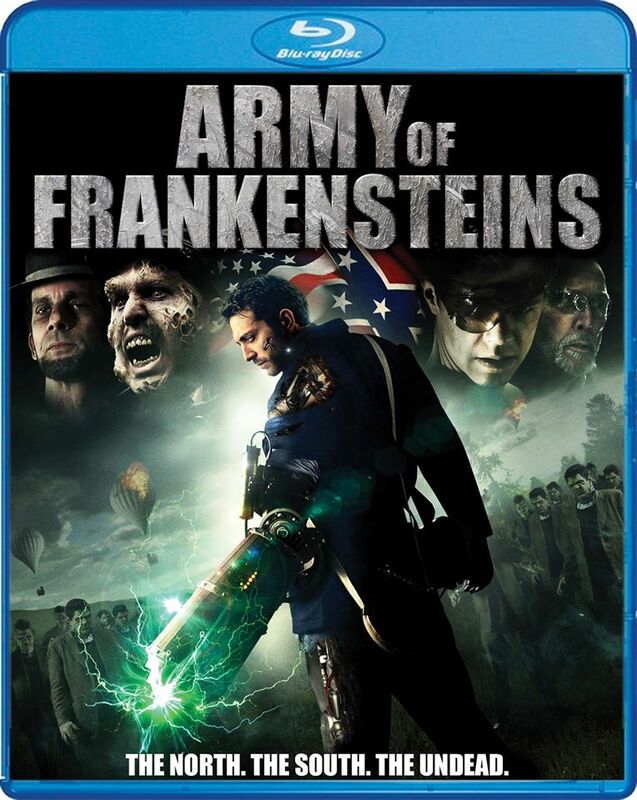 An over-the-top sci-fi/horror hybrid, Army Of Frankensteins is an outrageous film that dares to examine a history that never happened: The War Between The States… of Life and Death. After a failed attempt to propose to his girlfriend, Alan Jones (Jordan Farris) is beaten within an inch of his life by a street gang. Transported to the mysterious lab of Dr. Tanner Finski and his kid genius assistant Igor, Alan becomes the subject in a series of horrible experiments as part of the doctor’s plan to reanimate the legendary Frankenstein monster. But all bets are off when these experiments lead to a hole being ripped in space and time, pulling an army’s worth of the infamous creatures from hundreds of parallel universes and sending them all back to the 19th century – directly into the heart of a bloody battle between the North and South!